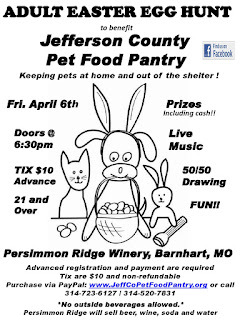 Jefferson County Pet Food Pantry : Adult Easter Egg Hunt to Benefit Jefferson County Pet Food Pantry!! Adult Easter Egg Hunt to Benefit Jefferson County Pet Food Pantry!! 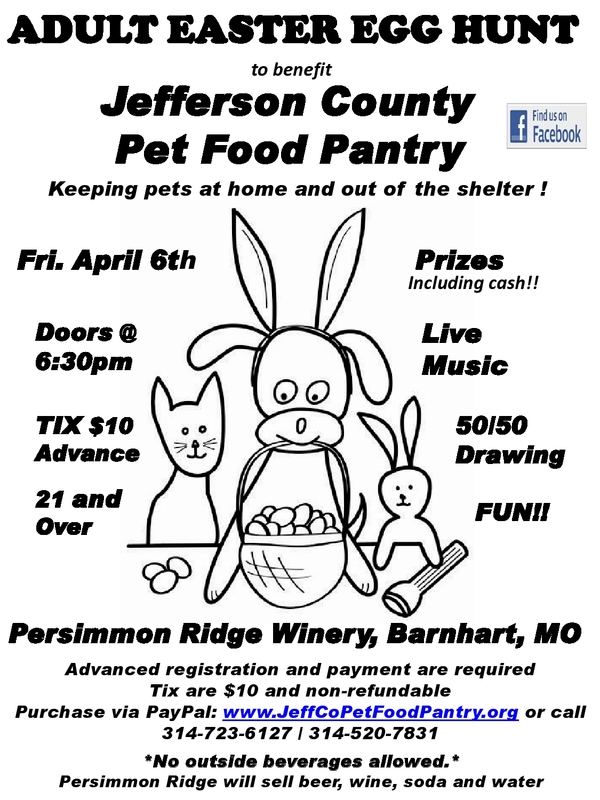 Live music, great wine, beautiful scenery, prizes, 50/50 drawing and the opportunity to help this small pantry that works tirelessly to help feed the pets of the less fortunate in Jefferson County, MO. Doors at 6:30. Hunt starts at 7:30. Wear appropriate clothing, bring a flashlight and a bag (or Easter basket). First 50 lucky people get complimentary rabbit ear head bands. Everyone participating will be required to sign a waiver at the door.